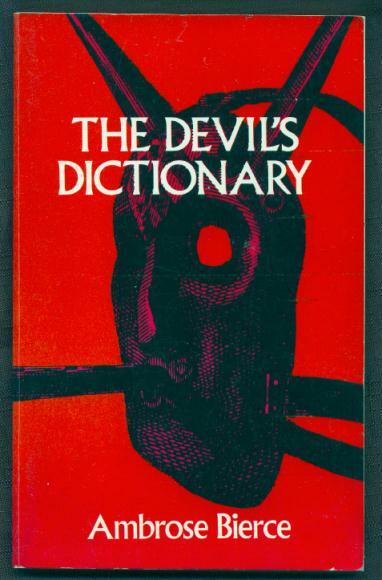 The Devil's Dictionary, a.ka. The Cynic's Word-Book (Ambrose Bierce, 1842 - 19??) has the distinction of not only being my fondest bathroom companion of 2010, but also being the best book I've ever found lying in a pile of rubbish on a Manhattan sidewalk. Tonight I would like to share some entries with you, selected along the theme of their relevance to contemporary United States politics. Multitude, n. A crowd; the source of political wisdom and virtue. In a republic, the object of the statesman's adoration. "In a multitude of counsellors there is wisdom," saith the proverb. If many men of equal individual wisdom are wiser than any one of them, it must be that they acquire the excess of wisdom by the mere act of getting together. Whence comes it? Obviously from nowhere — as well say that a range of mountains is higher than the single mountains composing it. A multitude is as wise as its wisest member if it obey him; if not, it is no wiser than its most foolish. Opposition, n. In politics the party that prevents the Government from running amuck by hamstringing it. Patriotism, n. Combustible rubbish read to the torch of any one ambitious to illuminate his name. In Dr. Johnson's famous dictionary patriotism is defined as the last resort of a scoundrel. With all due respect to an enlightened but inferior lexicographer I beg to submit that it is the first. Poverty, n. A file provided for the teeth of the rats of reform. The number of plans for its abolition equals that of the reformers who suffer from it, plus that of the philosophers who know nothing about it. Its victims are distinguished by possession of all the virtues and by their faith in leaders seeking to conduct them into a prosperity where they believe these to be unknown. Republic, n. A nation in which, the thing governing and the thing governed being the same, there is only a permitted authority to enforce an optional obedience. In a republic, the foundation of public order is the ever lessening habit of submission inherited from ancestors who, being truly governed, submitted because they had to. There are as many kinds of republics as there are gradations between the despotism whence they came and the anarchy whither they lead. Suffrage, n. Expression of opinion by means of a ballot. The right of suffrage (which is held to be both a privilege and a duty) means, as commonly interpreted, the right to vote for the man of another man's choice, and is highly prized. Refusal to do so has the bad name of "incivism." The incivilian, however, cannot be properly arraigned for his crime, for there is no legitimate accuser. If the accuser is himself guilty he has no standing in the court of opinion; if not, he profits by the crime, for A's abstention from voting gives greater weight to the vote of B. 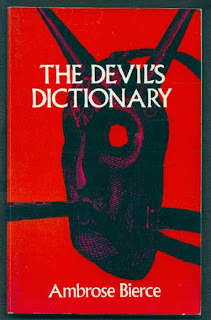 The whole satanic lexicon can be found in e-form right here. With Facebook, Zuckerberg seems to be trying to create something like a Noosphere, an Internet with one mind, a uniform environment in which it genuinely doesn’t matter who you are, as long as you make “choices” (which means, finally, purchases). If the aim is to be liked by more and more people, whatever is unusual about a person gets flattened out. One nation under a format. To ourselves, we are special people, documented in wonderful photos, and it also happens that we sometimes buy things. This latter fact is an incidental matter, to us. However, the advertising money that will rain down on Facebook—if and when Zuckerberg succeeds in encouraging 500 million people to take their Facebook identities onto the Internet at large—this money thinks of us the other way around. To the advertisers, we are our capacity to buy, attached to a few personal, irrelevant photos. When I read something like that, I have a little argument with myself: “It’s only poor education. They feel the same way as anyone would, they just don’t have the language to express it.” But another part of me has a darker, more frightening thought. Do they genuinely believe, because the girl’s wall is still up, that she is still, in some sense, alive? What’s the difference, after all, if all your contact was virtual? I think it's about time I took a walk. Near-full moon tonight. Later this week I'll have a post made up of my own words instead of other people's.